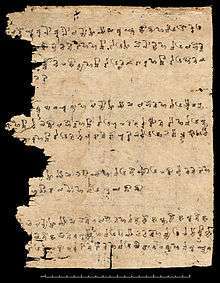 In the 11th century, it was remarked by Mahmud al-Kashgari that the people of Khotan still have their own language and script and did not know Turkic well. According to Kashgari some non-Turkic languages like the Kanchaki and Soghdian were still used in some areas. It is believed that the Saka language group was what Kanchaki belonged to. It is believed that the Tarim Basin was linguistically Turkified by the end of the 11th century. ↑ Mallory, J.P. "Bronze Age languages of the Tarim Basin" (PDF). Expedition. 52 (3): 44–53. Retrieved 16 March 2013. ↑ Hammarström, Harald; Forkel, Robert; Haspelmath, Martin; Bank, Sebastian, eds. (2016). "Saka". Glottolog 2.7. Jena: Max Planck Institute for the Science of Human History. ↑ Bailey, H W (1970). "The Ancient Kingdom of Khotan". British Institute of Persian Studies. 8: 65–72. doi:10.2307/4299633. ↑ Masson], [editors, A.H. Dani, V.M. (1992). History of civilizations of Central Asia. Paris: UNESCO. p. 283. ISBN 92-3-103211-9. ↑ Bailey, H W (December 1939). "The Rama Story in Khotanese". Journal of the American Oriental Society. 59 (4): 460. doi:10.2307/594480. ↑ Bailey, H W (1970). "The Ancient Kingdom of Khotan". British Institute of Persian Studies. 8: 68. ↑ Akiner (28 October 2013). Cultural Change & Continuity In. Routledge. pp. 71–. ISBN 978-1-136-15034-0. Litvinsky, Boris Abramovich; Vorobyova-Desyatovskaya, M.I (1999). "Religions and religious movements". History of civilizations of Central Asia. Motilal Banarsidass. pp. 421–448. ISBN 8120815408.